FREMONT, CA--(Marketwired - Dec 1, 2014) - Imergy Power Systems, a leader in advanced energy storage systems, today announced that Foresight Renewable Solutions has selected Imergy's ESP30 series vanadium-based flow batteries for a Smart Microgrid project sponsored by the California Energy Commission (CEC) and hosted by the U.S. Navy. Demand charge management: The project will demonstrate how well the system can release short bursts of energy when demand peaks occur, enabling users to reduce their electricity bills by lowering their utility demand charges. Load shifting: The project will prove how well the system can shift load from higher cost times of day to lower cost times of day, enabling users to reduce their electricity bills by shifting load to times when electricity prices are lower. Solar firming and ramp rate control: The project will show how well batteries can smooth out the jagged nature of solar power production, helping solar power systems provide more consistent power throughout the day. Island mode: The project will demonstrate how well a photovoltaic (PV) solar system and battery storage, disconnected from the grid, can provide energy for a user's critical loads during a given time period, enabling similar systems to be securely deployed at remote, mission critical facilities. 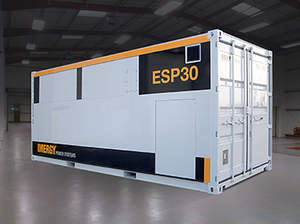 Three Imergy ESP30 series vanadium-based flow batteries will be incorporated into the project -- delivering 100 kW/400kWh, which will also feature a 50 kW PV solar panel system and GELI's Energy Operating System (EOS) to automate the multiple applications. The ESP30 series has a capacity of up to 50 kilowatts (kW) and can store up to 200 kilowatt hours (kWh) of electricity. Imergy produces its high-performance flow batteries using recycled vanadium from environmental waste, which is helping the company deliver the best performance and price points in the industry. Imergy delivers the lowest Levelized Cost of Stored Energy (LCOSE) of any competitor in the market. The Navy and U.S. military have been at the forefront in the development of advanced energy technologies. The Navy currently produces 12 percent of its total annual energy needs from renewable sources. Microgrids at military bases could help the military lower energy costs, expand their use of renewable energy, and reduce their dependence on diesel and grid connectivity for mission critical assignments. The market for energy storage is growing rapidly. The California Public Utilities Commission (CPUC) has mandated that the state's three largest investor-owned utilities add a minimum of 1.3 gigwatts (GW) of energy storage of energy storage infrastructure by the end of the decade. Worldwide revenue from energy storage for the grid and ancillary services is expected to grow from $675 million annually in 2014 to $15.6 billion in 2024, according to a report from Navigant Research. "Imergy is pleased to be a part of this project with Foresight Renewable Solutions, GELI, and the U.S. Navy," said Imergy Power Systems CEO Bill Watkins. "For military personnel, energy security can mean the difference between life and death. This Smart Grid project will pave the way for more secure energy solutions at mission critical military and other facilities." Foresight Renewable Solutions, LLC (FRS) is a leading independent power project developer specializing in the origination and development of clean energy generation, energy storage, and on-site power projects. FRS principals have led or managed the development and finance of 1,019 MWs of operating power projects - including solar, wind, gas, and thermal assets. FRS unites best in class technologies and partners to complete complex, high value, and bankable energy projects. FRS is headquartered in San Francisco, California. www.fr-sol.com. Geli (Growing Energy Labs, Inc.) provides the Geli Energy Operating System (Geli EOS) and Internet of Energy Platform as a bridge into the Internet of Things (IoT) for the control and financial optimization of energy storage systems, energy systems and distributed networks. Geli software is licensed to energy project developers, utilities, OEMs, and financiers to easily analyze, integrate, operate, and constantly validate multiple energy services from multiple assets. Geli has projects deployed and in development in C&I demand management, commercial and military microgrids, municipal solar & EV charging, and multi-family buildings. Geli is headquartered in San Francisco, California. You can find Geli on the web at www.geli.net and Tweeting at @growingenergy.